More than 4 million years since she last walked the Earth and more than 15 years since her discovery was first announced, a distant human ancestor dubbed “Ardi” was introduced to the general public on Oct 1, 2009. Nicknames abound in this field where long scientific nomenclature is common. 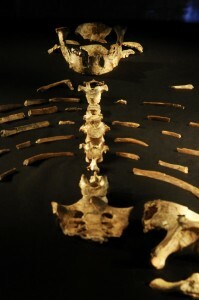 So, meet “Ardi”, a member of the genus Ardipithecus. Who was Ardipithecus? When and where did they live? What can we say about their diet and behavior? How do they relate to later fossils, such as Lucy, as well as to us? Where do they fit in with regards to our closest living primate relatives, the chimps? This is an extensive array of questions, not unusual to find when fossils are discovered. Scientists rely on an equally extensive array of approaches to find answers. Lets start with the first question: who was Ardipithecus? After their discovery of the first Ardipithecus remains in 1992, scientists had identified the bones of 17 hominid fossils by the end of 1993. These specimens were retrieved from a cluster of localities West of the Awash River, within the Afar Depression, Aramis, Ethiopia. Hominid and associated fossil faunas, including wood, seed and vertebrate specimens, were dated to about 4.3 million years ago. Over a period of several years, the team followed up with more excavations at the location of the original discovery. They collected 125 fragments of skulls, teeth, arms, hands, the pelvis, legs and feet. In addition to this skeleton, the area yielded a total of 110 other catalogued specimens representing body parts of at least 36 other Ardipithecus individuals. Ardi, as shown in the Oct. 2 issue of Science. There is more than one species within the genus Ardipithecus. Scientists distinguish between Ardipithecus kadabba (5.8 – 5.2 million years ago) and Ardipithecus ramidus (4.4 million years ago). Both discovered in the Awash valley in Ethiopia, these two species lived after the split between the human and chimpanzee lineages. They represent the earliest known hominids from Ethiopia. The remains of Ardipithecus kadabba and Ardipithecus ramidus have been found in Eastern Ethiopia. When they roamed that area, the Great Rift was a well-established geologic feature. The environment 4-to-5 million years ago was very different from that of today. The climate was cool and wet. Ardipithecus kadabba and Ardipithecus ramidus lived in an area of swamps, streams and dense tree cover, rather than in a mosaic of forest and grassland, as originally thought. This evidence has caused a re-examination of the hypothesis on the origin of upright walking. What can we say about their behavior? It seems that Ardi was equally at home on the ground as she was in the trees. Her feet, pelvis, legs, and hands suggest she walked upright on the ground but moved around on all fours when in the trees. The large, flaring bones of the upper pelvis were positioned so that Ardi could walk on two legs without lurching from side to side like a chimp. Ardipithecus gives us a close look at an upright walking being and a chance to evaluate the mechanisms that may have caused this behavior to evolve and remain until today. Traditionally, scientists suggested that the evolution of upright walking was closely related to the disappearance of the forest cover and its replacement by grasslands. Creatures adapted to living in trees were now forced to cross grasslands in order to go from one island of trees to another, the thinking went. However, crossing through the grass would make them very vulnerable to predator attacks. Walking upright allowed one to see predators sooner, thus representing a beneficial adaption to a changing environment. We now know that the origins of upright walking pre-dates the widespread disappearance of the forests and their replacement by grasslands. Bipedalism did not evolve as an adaptation to receding forest cover and expanding grasslands. Back to the drawing board, in other words. Bipedalism is now thought to have evolved in a tree environment. Questions remain: how and why? Among living non-human primates, researchers have observed bipedal stances in creatures such as orangutans as they move around in the trees, while chimpanzees most often stand upright when they feed on small objects in the trees. Early human ancestors, such as Ardipithecus, who lived in a tree environment, may have had similar adaptations. The discovery of the genus Ardipithecus and the study of the environment in which they once lived have caused us to revisit and refine the thinking on the origins of upright walking. However, we can’t be sure that bipedalism first emerged in the Awash Valley. Its origins may lie even further back in time. Upright walking may also relate to another aspect of Ardipithecus’ behavior: monogamy. Here is where a hypothesis originally dating back to the 1980s has found new traction. Dr. Owen Lovejoy suggests that instead of fighting for access to females, a male Ardipithecus would supply a “targeted female” and her offspring with gathered foods and gain her sexual loyalty in return. Walking upright freed his hands to carry the food, thus helping him to achieve this goal. How does Ardi relate to Lucy? Ardi pre-dates Lucy by more than a million years. She was larger and heavier than Lucy. Lucy was a more adept upright walker than Ardi. Both Ardi and Lucy lived well before stone tools were in use. Their brain size was similar to that of a chimp. Both were found in the same region of Ethiopia, with Ardi’s site just 46 miles (74 kilometers) away from where Lucy’s species, Australopithecus afarensis, was found in 1974. What traits does Ardi share with us, Australopithecines and chimps? Like chimps, Ardi had an opposable big toe. However, she was probably not as agile in the trees as a chimp. Unlike chimps, however, she could have carried things while walking upright on the ground, and would have been able to manipulate objects better than a chimp. And, contrary to what many scientists have thought, Ardi did not walk on her knuckles, White said. Moreover, Ardi’s small, blunt, upper canine teeth, very likely reflect amicable relationships, leaving open the possibility of pair-bonded couples living together in social units. Ardi’s dentition contrasts sharply (no pun intended) with the much larger canine teeth found in chimpanzees and gorillas, animals known for their teeth-baring threat behavior. The latter statement is a good example of how paleoanthropologists rely on various sources of information in their attempt to reconstruct past behavior, including comparative primatology. In this case, similarities in dentition between fossil and living primates form the basis for suggested similarities in behavior both past and present. While Ardi’s canines were smaller than those of chimpanzees and gorillas, Lucy’s canines were even smaller in comparison. Ardi’s teeth also revealed her and her ilk to be omnivores, eating a wide range of foods rather than specializing in a more restrictive diet of fruit or leaves. Being an omnivore is another trait that sets Ardi apart from chimps, animals that eat primarily fruits, and and gorillas, which eat primarily leaves, stems and bark. The research team surmised that Ardipithecus spent a lot of time on the ground looking for nutritious plants, mushrooms, invertebrates and perhaps small vertebrates. The shape of Ardi’s upper pelvis and aspects of muscle attachment in that part of the hip resemble much more an upright walking human than a knuckle walking chimp. However, the lower pelvis is much more primitive than anything found in other hominids. When the news about Ardi was released, it generated quite a buzz, underscoring the great interest in the study of human origins. Hundreds of media outlets covered the story. Predictably, creationist outlets use the sentiment that Ardi has overturned our understanding of human evolution to make their point that scientists “do not agree” when it comes to human evolution. In making this statement, they display a fundamental misunderstanding of how the scientific process works. Fortunately, there are a number of excellent sites that make the process of understanding the latest news both easier and much more palatable. Quite often, scientists were quoted stating that this find was “far more important than Lucy.” It also showed that “the last common ancestor with chimps didn’t look like a chimp, or a human, or some funny thing in between.” Questions also abound about what this will do to Lucy’s preeminent status in the world of paleoanthropology. Now that we have an older creature also capable of walking upright, so the thinking goes, will “Ardi” now become the buzzword du jour, instead of Lucy? In my opinion this is not the right question to ask. We are not dealing with a beauty contest among fossils. Each of these finds has substantially increased our understanding of human evolution. Lucy taught us that bipedalism pre-dates the expansion of the human brain as well as tool making. With Ardi, the most important contribution seems to be that we now need to look beyond chimps (the 98% genetic overlap between humans and chimps notwithstanding) as a model for a common ancestor. What this common ancestor may have looked like and when and where it lived, remains, as of now, a great unknown. I saw ardi on on the discovery ch. sunday night it was wonderful.